Jeff Tedford has always had a knack for bringing on an established secondary running back in the past. First there was J.J. Arrington backing up Adimchinobi Echemandu, Marshawn Lynch backing up Arrington, Justin Forsett backing up BeastMode, Jahvid Best backing up Forsett, and then Shane Vereen backing up Best. 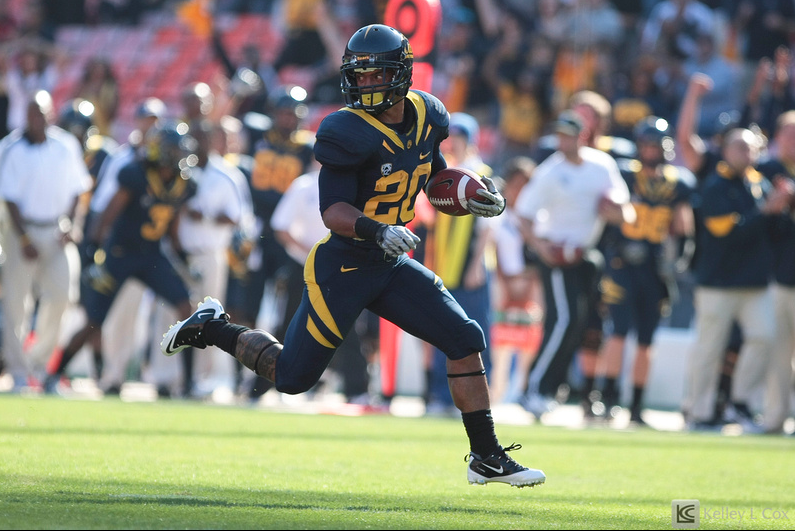 Going into 2011, Cal fans probably only knew #20 as the “fly sweeper” or “one of the gunners” on special teams. The only other season which there was a smaller sample size for the lead running back was in 2008, Jahvid’s first year as the main back. Recall an injury ended his 2007 season prematurely. Amazingly, he did put together enough runs/plays to have a 5 minute youtube video of him made in 2007 and we knew going into 2008, he was going to be good. Simply put, even though Jeff Tedford had been branded a “quarterback guru” in the past. Cal has been mainly “Tailback U” for most of the 2000s. What was usually a strength year after year, all of a sudden was a mystery. And the running game which was such a crutch the lean on to mask the inexperience at QB in 2010 might all of a sudden be a weakness? Perhaps not. The return of Jim Michalczik to stabilize the offensive line was definitely a plus. Plus there are some arguments on why a diminutive back (Isi is listed at 5 foot 8 and 185 lbs.) as opposed to a prototypical running back (5 foot 10 and 200 lbs. for Division I) could be more beneficial. 1) A lower center of gravity means better balance and ability to make cuts. This could lead to more game-changing home run plays that Cal fans are used to seeing. In addition, Isi’s quick speed makes him ideal for the new look Cal offense which plans to feature some zone reads. He probably can’t barrel through bigger linebackers, but he should be able to make some of them miss tackling him. Whether he acts as the dive-back the middle or the winged back running to the outside, his speed will be vital to cutting into those holes and beating defensive ends to the outside as Cal aims to implement more elements of the spread. 2) A smaller back is harder to find behind the line. Obviously this is the comical reason, but just ask current NFL linebackers Brian Cushing, Clay Matthrews, and Rey Maualuga how hard it was to tackle Jacquizz Rodgers. A patient back such as Isi can make the most of this and wait for blocks and holes to open behind the offensive line. 3) Not relying on one back leads to good experience and development of the committee. In the first game of the year against Fresno State C.J. Anderson and Covaughn DeBoskie-Johnson only had three carries between them. Obviously the passing game was doing pretty well so we didn’t need to lean to heavily on the running game (plus Zach Maynard kept the ball four times on the zone read). But it probably would be asking too much of Isi to have him carry the ball more than 350 times. Plus the idea of having change-of-pace backs is always a bonus to keep the defense off balance. Furthermore, spreading the ball around will give us a preview of the future and a chance for one of the backups to step up. In conclusion, Cal’s running game should be fine in 2011. While fans may be disappointed in the yards per carry (YPC) of 3.5 for Isi in the Fresno State game, he showed his explosiveness on the 36-yard TD run and ability to get to the edge in his goal line touchdown. The offensive line seemed to have worn down, and Fresno State began to stack the box in the second half knowing our gameplay was going to start getting conservative. The focus should be on drawing up plays on offense which make the most of Maynard’s athletic abilities and find ways to get it to our play-makers (Marvin Jones, Keenan Allen) in space or find mismatches in the middle for Anthony Miller.